Nothing is better than a steaming shot of espresso served in a stylish demitasse. A $2 espresso shot may not seem much. But if you visit your favorite local coffee shop on a daily basis, the expenses can add up. That can easily translate to around $60-$100 a month. Skip the long lines while saving money by investing on a cheap espresso machine. Espresso machines are expensive. But you don’t need to invest on top-of-the-line coffee machines to enjoy high quality espresso at home. If you can’t justify shelling out hundreds of dollars on an espresso machine, we urge you to read on. Here is a list of the best espresso machines under $100 to consider. These budget espresso machines are sure to make your morning coffee breaks extra special. If you want to prepare creamy espressos, cafe-like lattes, and delicious cappuccinos at home, but you have a tight budget, then this would be a great option for you. 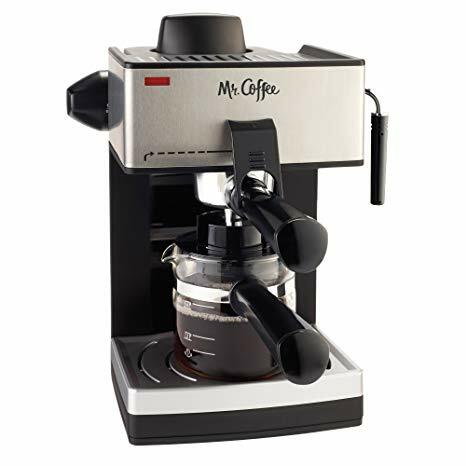 This Mr. Coffee espresso machine comes with a thermal block heating system that heats water quickly and evenly. Equipped with a 15-bar pressure pump, this espresso maker ensures it provides you with well balanced and perfectly brewed espresso. Dual shot brewing means you can make two shots simultaneously. It also comes with a built-in milk frother that allows great control over how the froth turns out. 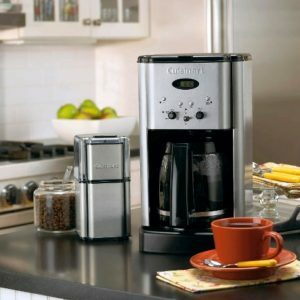 Both functional and aesthetically pleasing, the Mr. Coffee ECMP50 would be a welcome addition to your countertop. Cuisinart Brew Central makes great tasting coffee convenient for your busy lifestyle. Programmable from start to finish, you can program the machine to have coffee ready when you wake up or get home. That means, you don’t have to spend one waking moment caffeine-less. The coffee maker is capable of delivering up to 12 cups of coffee. You can cater to your entire family or a group of friends without a doubt in your mind. Brew pause feature lets you enjoy a cup of coffee before brewing has finished. It also comes with an adjustable heater plate, so you get coffee at the exact temperature you prefer. With elegant tech-industrial design and brushed metal finish, The Cuisinart Brew Central makes a bold statement in any kitchen. If you are in search of a cheap espresso machine that still performs very well, Hamilton Beach 40715 is a good choice for you. 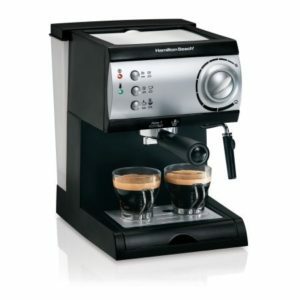 It features a powerful 15-bar Italian pump that extracts cup after cup of rich espresso. It also comes equipped with two brewing heads, thus, allowing you to make two cups of espresso at a time. Make sure, though, that you use a small cup as it is a tight fit. Although a cheap espresso machine, it is easy to use and well made. The easy to use design will turn you into a home barista in no time. Everything you need to make the perfect cup is included. You can easily make espressos, cappuccinos, and lattes in your kitchen any time of the day. De’Longhi is a trusted name in the coffee world. They are known for making good quality espresso machines, and EC155 is one of them. De’Longhi EC155 features a unique patented dual filter holder that allows you to use either ESE pods or ground espresso. It comes with a built-in tamper and a manual milk frother, so you don’t need to buy a milk frothing pitcher and grinder. 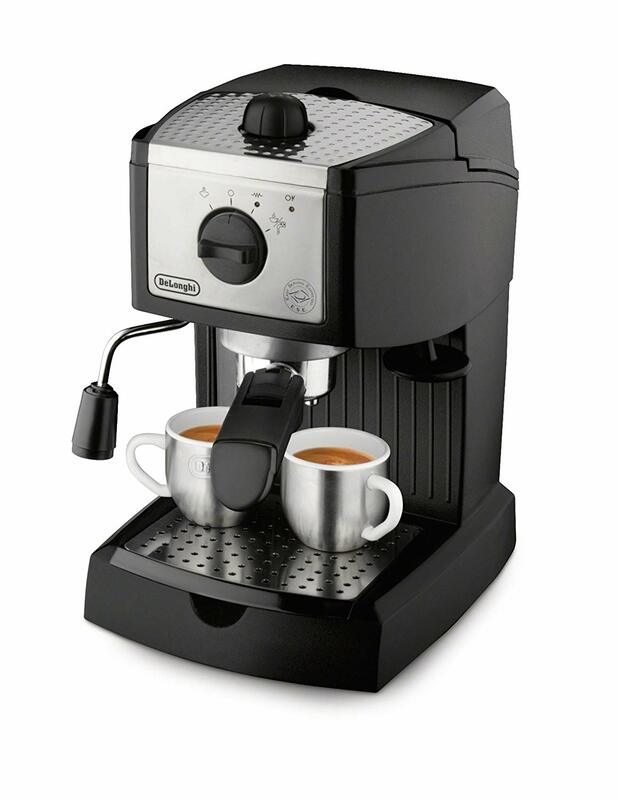 With its easy-to-use design and strong espresso, De’Longhi EC155 is an absolute bargain. It’s a basic machine that gets the job done. It is a great choice for coffee lovers who are just starting with espresso brewing and don’t want to spend hundreds of dollars on a coffee machine. Mr. Coffee ECM160 is one of the popular entry-level espresso machines around, and for good reasons. Unlike other espresso machines, the Mr. Coffee ECM160 has a steam heat feature that forces hot steam through the filter. The end result is slightly better than what you’d brew in a moka post. This cheap espresso machine also includes a glass carafe that’s easy to pour and won’t make a mess. There’s a frothing arm on the side, so you can easily steam and froth your milk. It steams milk beautifully and make decent espresso if you know how to use it. Since it is a steam espresso espresso machine, it doesn’t have enough power to make a real espresso. It makes good espresso, although the quality of the beverage won’t satisfy espresso lovers. We think it’s a better machine for lattes and cappuccinos than it is for espressos. 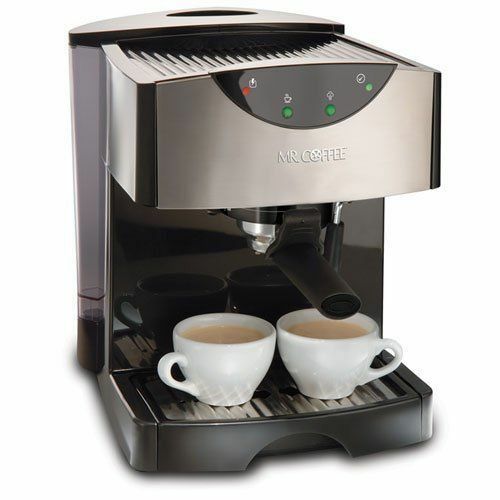 Overall, it is a decent espresso machine that appeals to coffee lovers who want to enjoy an occasional cup of espresso at home without breaking the bank. Buying an espresso machine can prove to be challenging, especially for those on a tight budget. The good news is that you can still enjoy good quality espresso at home without breaking the bank. 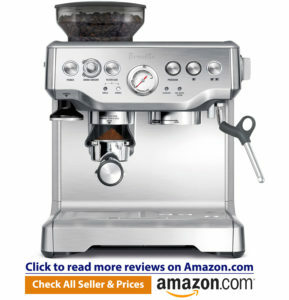 In fact, you can get a decent coffee machine for less than $100. Just because you have a small budget to work with, it doesn’t mean you are doomed to get a bad machine. Even in the $100 range, you can find a nice coffee machine that can make high quality espresso with a great frothy crema. Most of these machines even allow you to make espresso, lattes, and cappuccinos at your own kitchen. The next time you crave for these beverages, you no longer have to wait in line as you can easily whip one up in your own kitchen. Plus, investing on a cheap espresso machine will spare you from giving your hard-earned money to Starbucks.